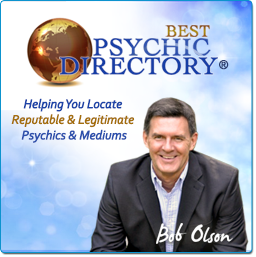 BestPsychicDirectory.com, BestPsychicMediums.com, OfSpirit.com and all other Olson Media Group, LLC resources, makes absolutely no guarantees or endorsements of any advisor (including psychics, mediums, tarot readers, astrologers, medical intuitives, energy workers, intuitives, empaths, sensitives, or any other type of psychic or divination readers) listed on or within this directory including the Instant Readings. The liability and responsibility for their products, services and/or the claims of their marketing, including their listing information on this website directory and their websites, rests solely with each individual practitioner (advisor, psychic or medium), and we do not accept liability and responsibility for them or their readings (Instant Readings or Scheduled Readings) in any way. The above-mentioned website resources are merely a directory, much like your telephone book, except that we focus on psychics and mediums. A listing on Olson Media Group websites does NOT suggest or indicate a certification or authorization by Bob Olson in any way, even if it indicates that he was personally satisfied with his own reading with any one advisor. When getting a reading from any advisor listed on BestPsychicDirectory.com, BestPsychicMediums.com, OfSpirit.com or any other Olson Media Group, LLC resource (advisors include psychics, mediums, tarot readers, astrologers, medical intuitives, energy workers, intuitives, empaths, sensitives, or any other type of psychic or divination readers), you agree to take full responsibility and to bear all liability for your interactions with the advisor and the results thereof, including but not limited to any disputes with any advisors and any mental, physical, emotional, spiritual, psychological, technical, technological, relationship, health-related, career, investment, financial, business, equitable, or legal harm you may suffer in connection with an advisor or any advice. You understand that any advisor listed on the above-mentioned resources does not guarantee you will be satisfied with your reading and does not remove your personal responsibility in choosing and hiring an advisor. Consequently you, on behalf of yourself and your family, friends, employees, principals, offers, shareholders, directors, attorneys, agents, predecessors, subsidiaries, successors, and assigns, covenant not to sue Olson Media Group, LLC, (which includes BestPsychicDirectory.com, BestPsychicMediums.com, and OfSpirit.com), its principals, officers, employees, directors, shareholders, partners, subsidiaries, agents, attorneys, predecessors, successors, and assigns (Olson Media Group entities) for, and hereby irrevocably release, discharge, acquit, remise, and waive all claims against the Olson Media Group entities from any and all liabilities, suits, claims, demands, actions, debts, bonds, accounts, damages (including but not limited to any incidental, direct, consequential, special, and punitive damages) expenses, losses, fees, costs (including but not limited to litigation costs and attorneys’ fees) of every kind and nature, known and unknown, suspected and unsuspected, accrued and unaccrued, disclosed and undisclosed, present, past, or future, legal, equitable or other, arising out of or in any way connected with any advisor or advice with regard to any such disputes. You are aware that certain state laws, provide essentially that: A general release does not extend to claims which the creditor does not know or suspect to exist in his favor at the time of executing the release, which if known by him must have materially affected his settlement with the debtor. You expressly waive and relinquish any right or benefit that you have or may have under such state laws, or any other statute or legal principle with similar effect.